We are constantly looking for innovative treatment methods and products that can help make treatment more convenient and comfortable for patients. Recently, we had the Dental Monitoring folks come by the office and I think the 3D monitoring product has good potential to help practices; however, they will need to adjust their business model slightly to achieve maximum impact. 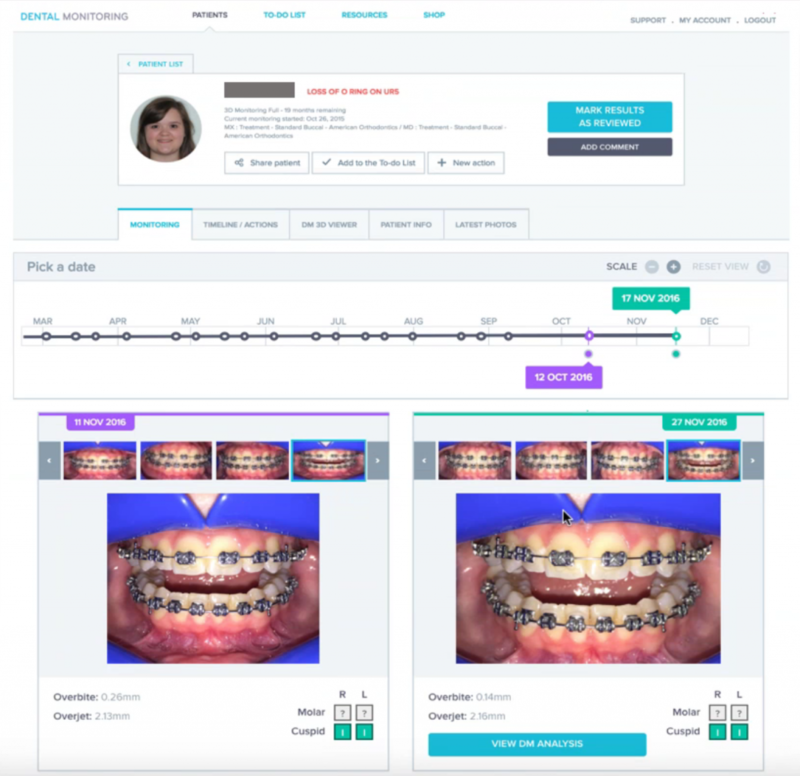 Dental Monitoring is a software service that allows patients to use their smart phones to capture tooth movements and communicate them to their orthodontist. This comes in the form of simple 2D photo/video monitoring of tooth position and full 3D monitoring and rendering of tooth movements. Photo Monitoring ($7.90/mo, 24hr turnaround) – Intra-oral pictures are automatically organized and evaluated by their technicians for broken appliances, poor hygiene, whether established treatment goals have been met and can be used in retention to check for tooth movement. 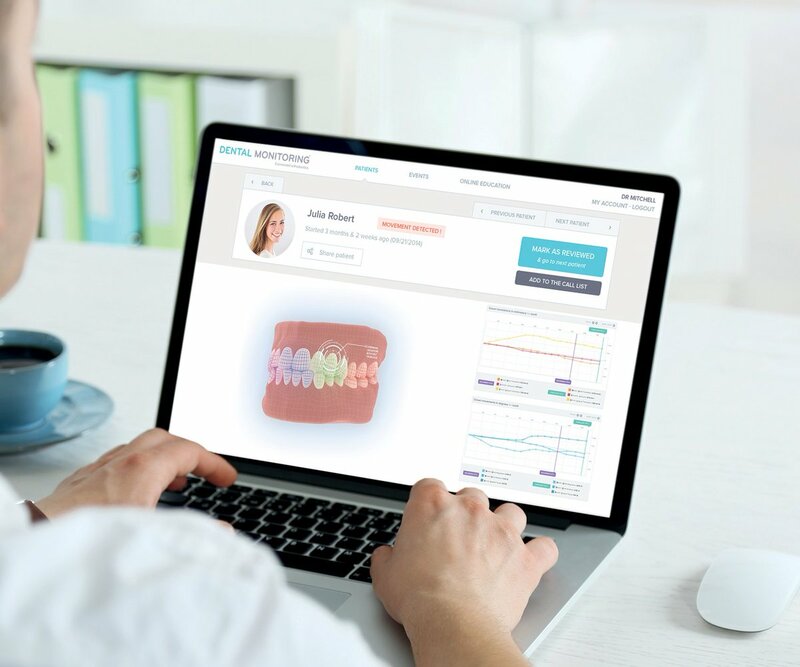 DM GoLive (12hr turnaround) – Same as photo monitoring, but designed for Invisalign patients, and additional photos are taken with aligners in place. Based on the position of the teeth relative to the aligners and their aligner fit, the patient is given a ‘Go’ or ‘No Go’ to advance to the next aligner. You can specify whether the patient must take photos before each aligner change or at set intervals. 3D Monitoring Lite ($9.90/mo, 48hr turnaround) – The doctor must upload an .STL file of an initial intra-oral scan (can also upload CBCT to show roots). With the photos and the locators on the the cheek retractors, the software and technicians are able to generate a 3D model of the current tooth position to within 7-9microns (company data). 3D Evaluations can only be done once a month. Full 3D Monitoring (15.90/mo, 48hr turnaround, volume discounts) – The Full plan is the same as the Lite, only with unlimited 3D evaluations that can be performed during treatment. Both the Lite & Full 3D monitoring allow for quantification of dental movements. How is this Useful to Your Practice? The Dental Monitoring service is built on the premise that everyone now carries a smartphone; however, that also means that photo monitoring and FaceTime appointments can be implemented without purchasing additional software. We routinely do this for international and out-of-state patients already so I don’t see the photo monitoring plans offering much value to the practitioner. The DM GoLive, is an interesting concept, but weekly photo submissions add additional compliance burdens on patients and in my view would be counterproductive to treatment. The patients compliant enough to complete these weekly evaluations aren’t the ones need the service to help titrate their aligner wear effectively. Additionally, all of this can be implemented in-house with a team member assigned to review Invisalign compliance without additional costs. Scheduling Optimization – By using 3D monitoring over a specific time period with carefully selected cohorts, you can refine appointment intervals and your mechanics to optimize your schedule. Reduced Appointments? – Promises of reducing the number of appointments fall a little bit flat because only appointments that don’t require the orthodontist for activation can be eliminated for the patient; otherwise, you are already over-scheduling. Where you will save appointments would be with elastic correction, self-activated appliances like Invisalign, specific space closing mechanics, etc., but this can all be done with in-house photo monitoring. Streamlining Repositioning Appointments – Combining the 3D monitoring with a low-dose CBCT you have the ability to track roots, allowing you to pre-plan your reposition appointment prior to the patient arriving in the chair. This saves clinical time and allows you to evaluate root position without having to take a radiograph. 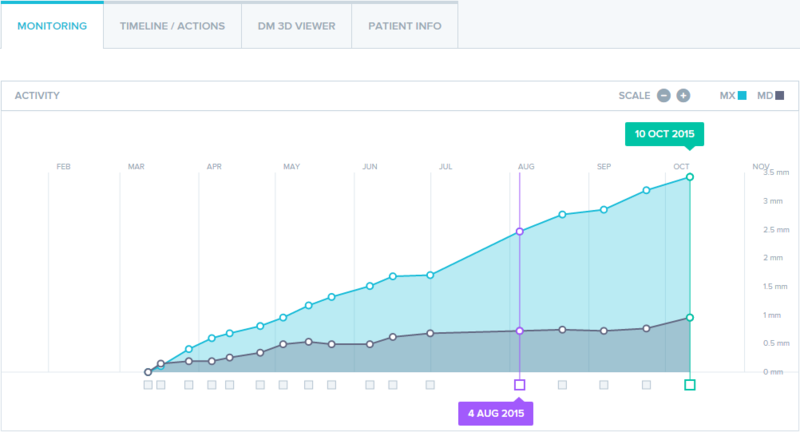 Virtual Retention Visits – With 3D monitoring, the stability of alignment can be evaluated without an official visit (ex: while patients are away at college). However, they need to implement pay-per-monitoring pricing for this to be most effective. Treatment Research & Data-Mining – The ability to quantify individual tooth movements is going to be a huge benefit to researchers, and will help independent practitioners evaluate new products in a more objective fashion. One of the biggest problems in assessing treatment acceleration modalities is that many of the studies lack interim data between wire intervals so the exact impact on the rate of tooth movement is unclear. Appliance Fabrication – The service will become exponentially more valuable when the 3D modeling can be used to fabricate appliances and retainers while saving the patient a visit. Retainers to recapture slight shifting for out of town patients can be fabricated and sent without a visit, customized finishing archwires can be fabricated in advance of appointments, refinement scans for additional clear aligners with Invisalign, and digital removal of brackets or attachments from patient scans can be used to make final retainers are just a few of the possibilities. 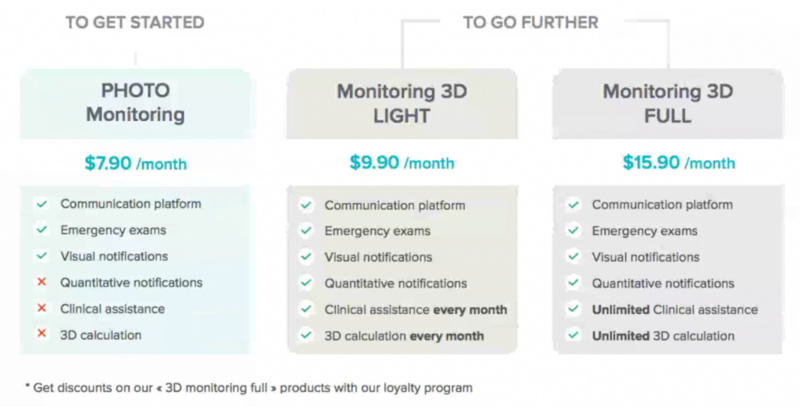 The current verdict on this service is that there is big potential, but it’s main value is in the remote 3D monitoring. If you want photo monitoring only, patients already have a smart phone and the means to provide this data. Additionally, I would love to see them implement a pay-per-scan option, since many of the applications above are better suited for a single use than a monthly plan. This is especially true for retention patients and use for reposition appointments.